This beautifully-designed apartment is set in extensive landscaped gardens and parkland, with cherry trees, flowering shrubs, a large swimming pool, tennis court, boule pitch and lots of space for other outdoor activities. 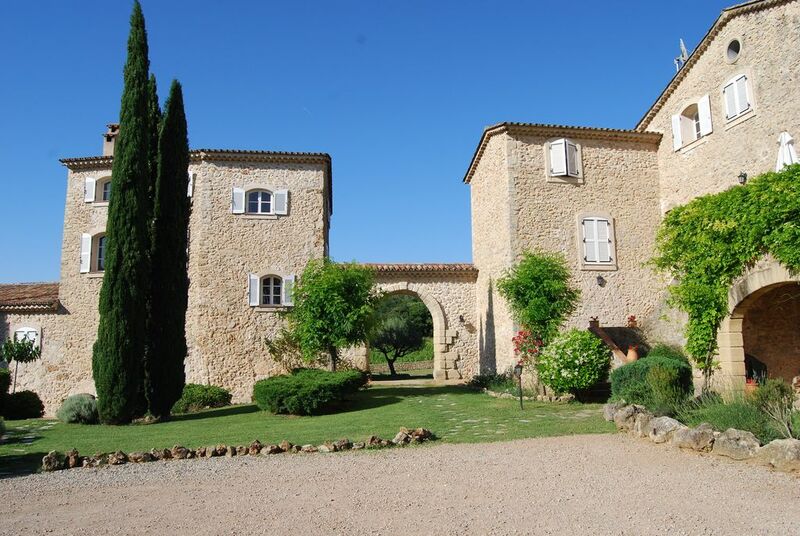 A twelfth century château & its outbuildings have been converted into 11 houses and apartments. Ours has two bedrooms (one double, one twin, both en suite), a double reception room, laundry room and private terrace with large dining table and BBQ. Blissfully cool in the heat of summer, it has full heating and an open wood fire for cooler months and is truly a delight in autumn months. Tranquillity and beauty are guaranteed: the château looks out onto vineyards and rolling hills. The swimming pool and tennis court are shared between occupants of the 11 residences. Enjoy the local vineyards: Local vineyards abound. Nearly all have their own “caves” where wine is sold across the counter, and you can taste first. You can buy by the bottle or by the container (of which we have three in the kitchen corner, with one tap). Château de Berne is the local expensive cave, and beautiful to visit. We tend to buy “La Rose Tremiere” – they have a roadside shop just a couple of kilometres from here, on the road into Lorgues. Heaven for gourmands: Top of the list of local restaurants is Michelin-starred Chez Bruno, with a truffle-based menu that changes three times a week, and the more intimate Le Chrissandier, known for its locally-sourced food. If you're cooking for yourself, there's a spectacular market in Lorgues on Tuesday morning, and one somewhere in the area on any other day of the week. Within easy reach are: L'Abbaye du Thoronet, a former Cistercian abbey from the 12th century, now restored and turned into a museum; Chartreuse de la Verne, (27 km),a Carthusian monastery, beautifully situated in the middle of the Massif des Maures and surrounded by forests; Gorges du Verdon (28 km), a 25 kilometre-long river canyon that is considered by many to be Europe's most beautiful and Aqualand Water Park - Sainte Maxime. Beautiful local villages include Entrecasteaux, which has a 16th century castle built on 11th century foundations; Cotignac, which sits under cliffs and square medieval tours; and Tourtour, known as the 'villages in the sky', from which one can look out over the whole of Provence. Golf: The Saint Endréol golf course stands in a grandiose, sun-drenched natural setting. It is a spectacular 18-hole course of international renown, which offers splendid views over the river Endre and on the red rock of the Rocher de Roquebrune. At the entrance to the Clubhouse, an ancient Roman well has been restored and converted into a fountain, exemplifying the harmonious integration of tradition and modernity. Ski: The ski resort of Valberg has direct access to 91km of downhill skiing, with 52 individual pistes, served by 22 ski lifts. With skiing above 2000 metres, snow cover is generally reliable. Valberg is able to augment natural snow, on 45km of ski runs, with 350 Snow Cannons. The 22 Ski Lifts of Valberg are able to uplift 21,000 skiers / snowboarders per hour.